Pascal was the weapons officer of the UNSC In Amber Clad. 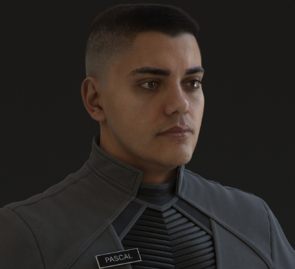 Pascal served under the command of Commander Miranda Keyes alongside the ship's navigator Remi. In November 2552, Pascal was present during the Battle of Earth and the pursuit of Solemn Penance over New Mombasa to Installation 05. Pascal was voiced by Bungie employee Jay Weinland. The character was not named until his remastered appearance in Halo 2: Anniversary. Pascal after arriving at Installation 05.